Andrew Alliance S.A. and Sartorius today announced the launch of the Andrew Alliance Pipette+ system, which uniquely provides both full traceability and improved repeatability in manual pipetting for life science laboratories. Andrew Alliance, the robotics company with an innovative approach to liquid handling that is improving repeatability of conventional laboratory pipettes, and the Life Science company Sartorius, are collaborating to bring this intelligent pipetting solution to market. As much as half of all research funding in life sciences is used to repeat experiments, showing that lack of reproducibility in research is an ongoing challenge in the biopharmaceutical industry. A major cause of irreproducibility has been incorrect execution in liquid handling workflows. This collaboration between Andrew Alliance and Sartorius reflects both companies’ strategic investment in designing innovative pipetting solutions to improve reproducibility and simplify the complex and time-consuming workflows. 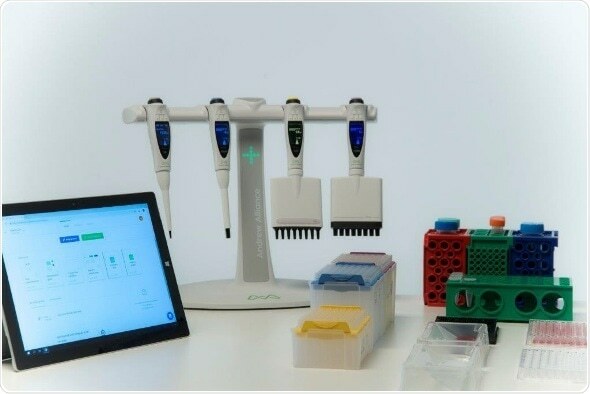 The Andrew Alliance Pipette+ system comprises several components that communicate with one another: electronic single and multichannel pipettes, an intelligent stand, and novel cloud-based software. Andrew Alliance co-developed the Pipette+ system with Sartorius, who is manufacturing the pipette hardware. The hardware is based on Sartorius’s Picus® range of award-winning, ergonomic electronic pipettes. Using the current-day Internet of Things (IoT) solutions, the pipettes communicate wirelessly with the stand by Bluetooth, and the computerized charging stand communicates with Cloud servers by either Wi-Fi or Ethernet. The pipette transmits data to the stand, such as possible errors, operator identity, and step-by-step actions taken by the operator, ensuring full traceability and improved repeatability. The software system uses Andrew Alliance’s free, browser-based intelligent software environment, OneLab. This software allows intuitive protocol design and simplified protocol execution. For instance, the software can indicate which pipette is to be used at each step in an experiment, preset the required pipetting parameters, and eject tips at the appropriate time. Thus, users can complete protocols in a few clicks. The Andrew Alliance Pipette+ system, therefore, combines the best-in-class pipetting performance, and excellent ergonomics Sartorius’ pipettes are known for, with intelligent software. Venkat Rao, Head Business Management, EMEA Life Science Research at Sartorius. Life science researchers should be confident that their often highly limited biological samples, costly reagents and time, are focused on progressing valuable research rather than unnecessarily repeating experiments. Piero Zucchelli, CEO and Co-founder, Andrew Alliance.